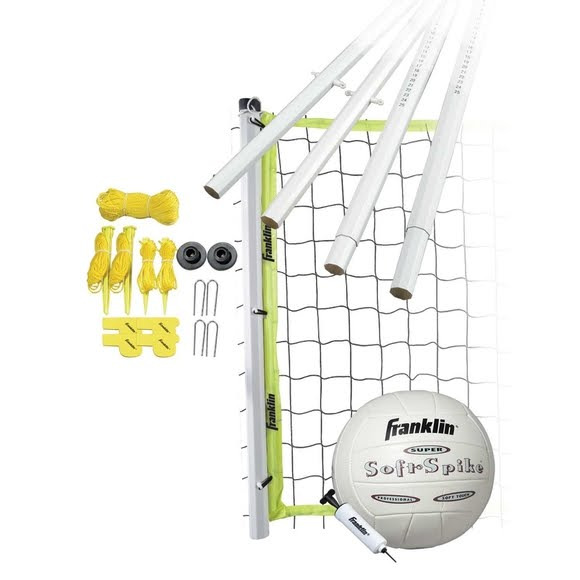 You'll never look at your backyard the same way again after setting up Franklin Advanced Volleyball Equipment. Everyone from your friends, family and kids will have a blast playing a fun game of volleyball outside on a sunny day. You&apos;ll never look at your backyard the same way again after setting up Franklin Advanced Volleyball Equipment. Everyone from your friends, family and kids will have a blast playing a fun game of volleyball outside on a sunny day. The advanced set includes everything you need to set up and play from an official size volleyball and mini-pump to tension clips and ground stakes to support the sturdy net. No matter your level of play, Franklin&apos;s Advanced Volleyball Equipment is enjoyed by all.